We received a new gig. Our goal is to review this application written in nodejs and see if we can get the flag from this system. Are you up for this? This a client/server chat app coded in Node.js. We understand that we need to connect using two arguments. A comment warns us that we should keep the channel private, so I understand they will be a way to leak the flag in the channel. Now let's look at the server side code. In helper.js we can see a potential vulnerability. There is a system call with cowsay and message as an argument. So I had to look for where getAscii was called to see if message is injectable. So in message there will be u and c that seem to match user name and user country. I then check in clientManager.js for getUsername and getCountry to be sure. But I received Invalid settings. from the server. Let's look at server side code again. In server.js we see a function validUser is called when we register. Let's see if we can bypass that (validUser in helper.js). They used a blacklist, block array lists all user attributes that are blocked. So the only one we can provide when registering is name. But name can only contains alphanumeric characters because of the following regex /^[a-z0-9]+$/gi. This will be hard to make command injection with only alphanumeric character. In message we can only control name or country so there must be a way. Maybe there is a vulnerability in this JSON lib too, and it is dangerous to put unfiltred user input directly in the parse method. country is not filtered but we can't create it, so we will use this prototype poisoning to bypass the validUser function. You can study more in depth the behavior of JSON.stringify() on MDM web docs. In fact in the register event, the JSON.parse output is sent as input of helper.clone. In helper.clone the user input is copied as an object and under certain conditions is operating deep-copy from user supplied data to the session user object. Most deep copying libraries iterate over an object’s own properties, copy the primitives over, and recurse into the own properties that are objects. JSON.parse will produce an object with a __proto__ property, and the deep-copy helper will copy the country property onto the prototype of newUser. So we bypassed validUser which was preventing to create it directly. 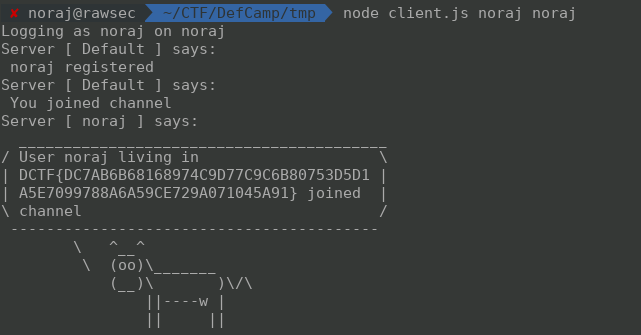 Using this in client.js, we will see $(cat flag) displayed on the cow message. It worked but the payload was not executed. This is because the message is escaped with simple quote in getAscii. To bypass that we only need to surround our payload with simple quotes and spaces.